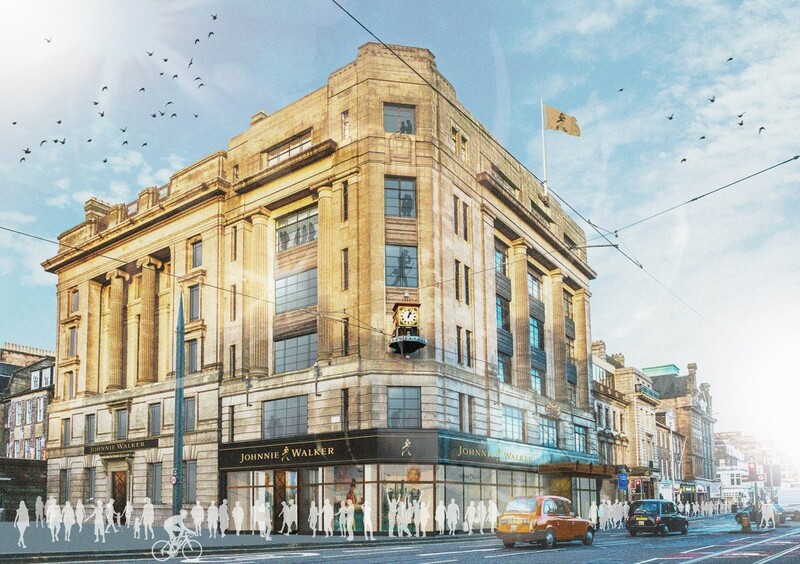 Drinks giant Diageo has stepped up plans for a nationwide network of visitor attractions with the submission of plans for a hub attraction on Edinburgh’s Princes Street. 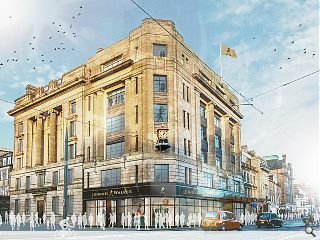 The Johnnie Walker visitor centre would occupy all seven floors of the former House of Fraser department store at 146 Princes Street, which will be sensitively restored and updated by Simpson & Brown Architects to include a ‘sensory’ display detailing the history, art and science behind the brand. Also included in the mix would be a flexible events space, ‘bar academy’ for training hospitality workers, a rooftop bar and ground floor retail. Tony Hordon, MD of property investment firm Parobola which is working with Diageo, said:“At Parabola we feel like the custodians of a beautiful piece of Edinburgh real estate and we have taken great care to consider its future. 146 Princes Street represents an opportunity to deliver our core values: place, quality and destination. Other recent Diageo projects include the new distilleries at Port Ellen, Glenkinchie and Islay. Love the Home Alone esque silhouettes in the windaes - we're busy, look! Whilst I'm delighted that there will be a new use for this iconic and prominent building, I think its a bit of a shame that it will be Johnnie Walker theme park when Kilmarnock is the home of the brand. I think the cyclist on Shandwick Place is dicing with death with the tram tracks. The curse of the Holyrood establishment strikes again. Butcher the productive economy of Kilmarnock and replace it with a tourist trap in Auld Reekie. #3 Don't see what this has to do with Holyrood. But good luck finding more tourists in Kilmarnock than Embra. No offence, but honestly I wouldn't visit Kilmarnock even if you pay me. From all the reason in universe I cannot recall any. As for the Edi, it's a different story, so win-win. ‘Place, quality and destination’ Tony from Porabola’s core values. Deep stuff. Back on a planet free from reductive, corporate guff.... this building isn’t particularly beautiful, at all. What are the links between Johnnie Walker and Edinburgh and how do they compare to Kilmarnock? I fear we are about to re-visit one of of the biggest shambles of the 80's -- the Beatles museum moved from Liverpool to London using the same arguments set out above. That decision is not credible 30 years later and I fear that future generations will have the same thoughts about this. Scotland is now becoming "Edinburgh-shire" in the minds of the political and economic establishment. We have the ongoing example of London to guide us and yet we keep making the same mistakes. This ongoing focus on Auld Reekie is killing the rest of the country -- the Tartan Tories claim to be the Scottish National Party and it is time they lived up to the name. This is economic genocide starting at Newbridge. Just the latest and best example. Scotland is a lot more than Auld Reekie and its shortbread tin level of tourist engagement. If the message has not gotten out then it needs to be pushed and then pushed some more -- we are missing huge amounts of economic activity if to the tourist mainstream Scotland is a town, a castle and a monster. We are revisiting the shambles of London being England all over again. Yet too many blame Westminster for all our problems.